A holiday in England wouldn’t be complete without visiting a haunted and historic castle. 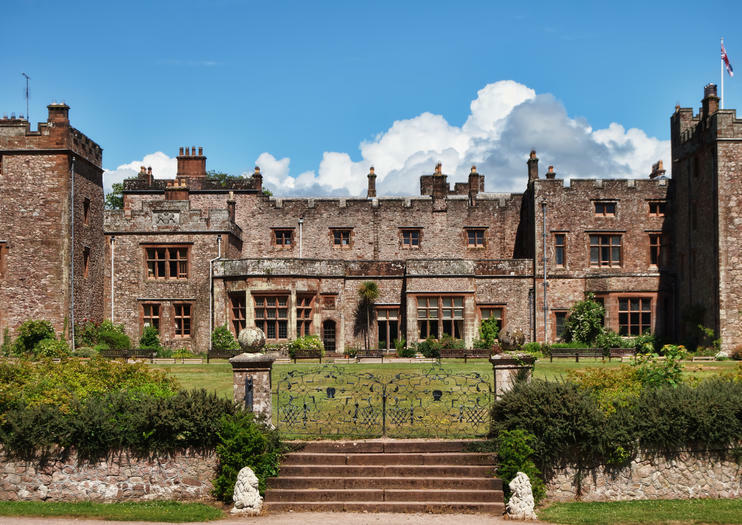 Cue Muncaster Castle and Gardens, a lavish 800-year-old property that is still lived in by members of the Pennington family, owners of the estate since the Middle Ages. Located in the idyllic Western Lake District and overlooking the Esk River, the castle was constructed in 1208 — it could, however, be much older than that; it is suspected that the castle was built over foundations dating back to the Roman era. Because of its key location along the Scottish–English border, Muncaster Castle features a fine example of a 14th-century peel tower, which was endemic to the area and intended as a watch tower where signal fires could be lit by the garrison to warn of approaching danger. Once described as “a gateway to paradise” by John Ruskin, the castle’s Terrace Walk features verdant flora and a meadow maze. One of the main particularities of the castle, outside its exceptional architectural heritage, is the presence of a ghost who goes by the name of Tom Fool, court jester. Rarely seen but frequently sensed, his playful spirit has been playing tricks on Tapestry Room visitors for well over four centuries. Muncaster Castle is open from March 30 to September 3 from noon to 4:30pm six days a week (closed on Saturdays for private functions). Tickets to the castle, gardens, owl center and maze cost £13 per adult, £7.50 per child and are free for children under 5. On-site parking is free for those who come by car from Liverpool or Manchester. The journey takes 2.5 hours via the M6 and the A5092. On-site accommodation is also possible at the Coachman’s Quarters B&B, with rates starting at £60 per night. Hours: Open from March 30 to September 3 from noon to 4:30pm, Sunday-Friday. Closed Saturdays. Admission: Adults: £13,Children: £7.50, Children under 5 are free. Immerse yourself in the stunning Lake District on this 4-day tour including accommodation and two day trips. Stay three nights at the 4-star Lindeth Howe Country House Hotel in Bowness-on-Windermere, and on arrival, enjoy free time to explore Bowness and Lake Windermere independently. On Day 2, enjoy a full-day tour to ten of Lakeland’s most beautiful lakes, including Grasmere and Buttermere. Then, on Day 3, experience the mountain passes and Ravenglass and Eskdale railway of western Lakeland. Daily breakfasts and dinners, plus hotel transfers are also included in your tour. Witness the grandeur of the Lake District’s central mountains and western fells on this full-day small-group High Mountain Passes tour from Lake Windermere. Traveling by air-conditioned minivan, follow a route first traced by the Romans over the Wrynose and Hardknott Passes, two of Britain’s steepest. Ascend through breathtaking fells; visit Roman Hardknott Fort, and ride the heritage Ravenglass and Eskdale railway. After a lunch break, admire spectacular views of Wastwater before returning to Windermere via Coniston Water. Explore the best of the Lake District on this 3-day experience from Manchester, including hotel or guesthouse accommodation and return transfers from Manchester. Enjoy our Lake District from Manchester Tour including highlights such as a lake cruise and visiting Tarn Hows & Hawkshead. You'll also join our High Adventure Tour which travels over two of the highest mountain passes in England, Wrynose & Hardknott, travel on a heritage ride and visit Muncaster Castle gardens. Finally you'll also experience our morning 1/2 day tour, including Six Lakes in a morning before traveling back to Manchester that afternoon. Discover the spectacular mountain landscapes of the Lake District without having to hike on a 9.5-hour minibus tour of the national park’s high mountain passes from Keswick. Absorb incredible views from the Wrynose and Hardknott Mountain Passes, ride through Eskdale Valley on the famous Ravenglass and Eskdale Railway, and drink in panoramas from Wastwater, voted Britain’s best view. Entry to Muncaster Castle and a ride on the Ravenglass and Eskdale Railway are included. Explore the rugged Lake District on this 5-day experience from Windermere, including hotel or guesthouse accommodation and two full-day tours & one half day tour. Enjoy a Ten Lakes Spectacular trip with a lake cruise and visits to pretty Buttermere, Grasmere and Keswick; plus a High Mountain Passes tour over epic Hardknott Pass to see Muncaster Castle and ride the Ravenglass and Eskdale railway. You will also enjoy a half day Beatrix Potter's Favourite Countryside Tour visiting Hawkshead, Tarn Hows and Hill Top Farm. As well as breakfasts, your tour includes a fantastic overview of the Lake District plus round-trip hotel transfers in Windermere and Bowness. Explore the Cumbria region by auto, train, and boat on this 3-day, 2-night tour. Travel through scenic villages and over mountain passes, admiring the picturesque views and scenery. Take a ride on a narrow gauge railway and enjoy a lake cruise. Two nights accommodation in either a bed and breakfast or hotel are included. Our Private Hire High Adventure Tour is the perfect opportunity for small groups of friends or family to enjoy their very own Private Tour. Our luxury, spacious 6 seater minibuses will allow you to travel the Lake District in style. Explore two UNESCO World Heritage sites and the Lake District National Park on this 4-day experience from Manchester, including hotel or guesthouse accommodation and return transfers from Manchester. Enjoy our Lake District from Manchester Tour including highlights such as a lake cruise and visiting Tarn Hows & Hawkshead. You'll also join our High Adventure Tour which travels over two of the highest mountain passes in England, Wrynose & Hardknott, travel on a heritage ride and visit Muncaster Castle gardens. As well as our Full Day Roman Britain & Hadrian's Wall Tour including the Roman Army Museum & Vindolanda. Finally you'll also experience our morning 1/2 day tour, including Six Lakes in a morning before traveling back to Manchester that afternoon. Explore the best of the Lake District on this 3-day experience from Liverpool, including hotel or guesthouse accommodation and return transfers from Liverpool. Enjoy our Lake District from Liverpool Tour including highlights such as a lake cruise and visiting Tarn Hows & Hawkshead. You'll also join our High Adventure Tour which travels over two of the highest mountain passes in England, Wrynose & Hardknott, travel on a heritage ride and visit Muncaster Castle gardens. Finally you'll also experience our morning 1/2 day tour, including Six Lakes in a morning before traveling back to Liverpool that afternoon. Explore two UNESCO World Heritage sites and the Lake District National Park on this 4-day experience from Liverpool, including hotel or guesthouse accommodation and return transfers from Liverpool. Enjoy our Lake District from Manchester Tour including highlights such as a lake cruise and visiting Tarn Hows & Hawkshead. You'll also join our High Adventure Tour which travels over two of the highest mountain passes in England, Wrynose & Hardknott, travel on a heritage ride and visit Muncaster Castle gardens. As well as our Full Day Roman Britain & Hadrian's Wall Tour including the Roman Army Museum & Vindolanda. Finally you'll also experience our morning 1/2 day tour, including Six Lakes in a morning before traveling back to Liverpool that afternoon.